Against all odds and the forewarning of my arborist, my apple tree is alive. I can't tell you how happy this makes me. When I was told three years ago that I needed to cut down my tree because it had fire blight, an invasive disease that would kill the bark and limbs of the plant, I was more than sad. To some, an apple tree is just another plant in their yard, but to me, my apple tree meant (and still means) much more. I love my apple tree. Obviously, there are the crisp fresh apples it produces, which I am very fond of. From fresh apple pies and cakes to apple syrup and butter, I have tried to make the most of the fruit my tree ekes out each year. Yet even without the fruit I would still love the blossoms that seem to abruptly arrive in a burst of pink each spring, and the family of birds that nests there -- just outside my family room window. I love the shady patio that is protected from the mid-day sun by those craggy limbs full of green leaves and the privacy they provide from my neighbor's yard. My tree also reminds me that apples are not all Fuji, Braeburn, and Granny Smith. You see the apples that grow on my tree seem to be some sort of heirloom variety that is not sold in stores. These trees appear on almost every lot in my neighborhood, but I've never seen apples like them in grocery stores or farmers' markets. My neighborhood is old (coming up on 100 years) and who knows when these trees were planted. I'm guessing in the 70s, but maybe the seeds that started them were here earlier. Who knows. Both the time when they were planted and the name of this apple seem to be a mystery, yet what is evident is the presence of this forgotten varietal. Yes, I can get very sentimental about my tree. So this year, instead of mourning the loss of my tree -- as I've been expecting to do for quite a while now -- I instead happily made my yearly supply of apple butter. Although this jam takes hours to simmer, the preparation is really quite simple. 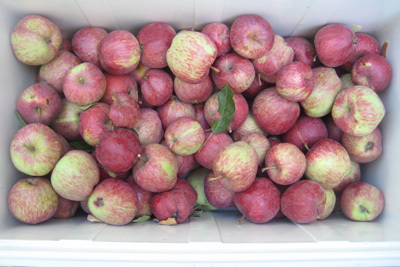 Apples are full of natural pectin, so you never have to worry about it setting or firming up. Just peel, core, chop, cook and can. Ever since my tree got its death sentence, I've really grown to appreciate everything about it. 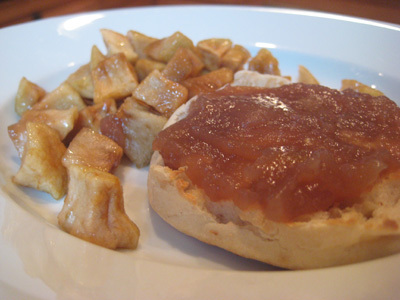 When I sit in its shade, I enjoy the cool breeze a little more, and when I take a bite of apple butter I taste the sweet caramelized flavors more intently. It's a good reminder to appreciate what you have, when you have it, because you just never know, from season to season, what will be left behind. Put all ingredients in a large pot and bring to a boil. Immediately lower heat and simmer for 5-7 hours. Can or freeze.